Marc Benioff probably doesn’t mind a few clouds. Salesforce.com’s CEO believes that cloud computing is a big part of the future, and has called the book he wrote about Salesforce.com’s rise Behind the Cloud. But Benioff isn’t just talking about and promoting the cloud. He’s putting his money where his mouth is, and Salesforce.com is increasingly looking to play a larger role in the cloud computing market. Yesterday, the company made one of its biggest announcements yet: Database.com. Billed as “the enterprise cloud database,” Database.com aims to make your existing database a thing of the past. 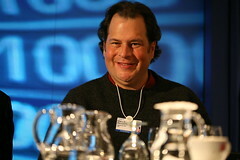 Instead of installing MySQL on your server, or spending thousands upon thousands of dollars licensing MS SQL Server or Oracle, Benioff believes “Databases need to be in the cloud” and wants businesses to store, manage and interact with their data using Database.com, which will be publicly available in 2011. On paper, Database.com does look interesting. The cloud has lured many with promises of scalability and redundancy, and some will certainly be intrigued by the possibility of a cloud-based database solution that offers the same. And, Database.com appears to have many of the features developers would require, such as stored procedures and triggers. Salesforce.com is also heavily promoting the security features of Database.com. But will Database.com be a serious contender in the multi-billion dollar database market? Can it really compete with mature open source RDBMSes like MySQL and PostgreSQL and commercial offerings like Oracle and MS SQL Server? The answer on both counts: probably not. Businesses interested in moving their databases to Database.com will need to migrate them, which may or may not be such a pleasant task. Once their databases are set up, businesses will either need to modify their applications to use Database.com’s SOAP and REST APIs, or they’ll need to rely on third-party database drivers. For web applications, where responsiveness is a must, it’s questionable as to whether it really makes sense to add the overhead of a web service to conduct database queries. Finally, it’s unclear how many businesses will want to support Database.com databases if their DBAs are specialized in an existing RDBMS. These three things alone might be deal-breakers, but in my opinion, the biggest deal-breaker is price. Database.com is free up to 100,000 records and 50,000 transactions a month. Beyond that, every 100,000 records will cost another $10, and every 150,000 will cost another $10 as well. To put this in perspective, consider that a site I’m involved with has a MySQL database containing just over 1.5m records which is used by a modestly popular website. This would probably cost, at a minimum, $150 monthly to operate on Database.com, which is only about $50 less than the entire server that hosts the database, web application — and several other websites. Notwithstanding all of the advantages Database.com might have, it’s quite clear: at the low end (my example), Database.com is unnecessarily expensive, and at the high end (MS SQL Server and Oracle users), it’s quite possible that Database.com will cost more over the long haul than enterprise solutions. Which highlights the problem with Database.com: on paper, it sounds cool, but it sort of lives in no-man’s land. Salesforce.com’s cloud competitors, such as Amazon.com, seem to have better positioned products. For instance, Amazon’s RDS offering provides a cloud-based MySQL instance, which applications can work with as they would any MySQL database. And even Microsoft’s SQL Azure appears to be much cheaper. While it would be foolish to write off Salesforce.com, one thing is clear: the cloud is maturing. The days of being able to launch a new cloud-based offering and pretend that it’s superior are long gone. Photo credit: Robert Scoble via Flickr. Two channels. One search. Zero excuses. Most brands now engage in organic and paid search to a greater or lesser degree, but most do so with little understanding of the interaction between the two mediums, and therefore fail to acknowledge that search is one medium and not two and should be managed as such for maximum return. In Facebook’s non-stop push to dominate the world by making its service the social fabric of the web, it has courted developers and publishers with a platform and suite of tools. Most of these tools give developers and publishers the ability to tap into Facebook’s vast audience and its social graph, which is attractive for obvious reasons. In return, Facebook’s footprint on the web grows as users are exposed to its functionality almost everywhere they go. It’s widely assumed that search engines are incorporating signals from popular social networking hubs into their algorithms. After all, millions upon millions of links are shared every day on sites like Facebook and Twitter. It would be somewhat surprising if search engines like Google and Bing were ignoring these links, particularly given the fact that the largest search engines all have data deals in place with Twitter and/or Facebook. But which signals are being used, and what sort of weight are they being given? Thanks to interviews Search Engine Land’s Danny Sullivan conducted with both Google and Bing representatives, we now have a better idea.